Guided by a strong sense of discipline and tradition, Shireen Taweel’s installation of copper, light and sound charts the history of the country’s mosques. Inspired by remote Australian landscapes and Islamic decorative arts, Taweel’s approach is rooted in cross-cultural dialogue and consideration of sacred and non-secular spaces. The resulting work is a delicate and meditative intersection of past, present and future. I acknowledge this work was shot on the land of the Arabana People. Australia is the land of the Aboriginal and Torres Strait Islander People. Sovereignty was never ceded. from Broken Hill to Campbelltown considers the local environment and the values captured within sacred infrastructure built by minority communities, acknowledging the parallels between early Muslim settlement within regional Australia, and today's cultural landscape of South Western Sydney. 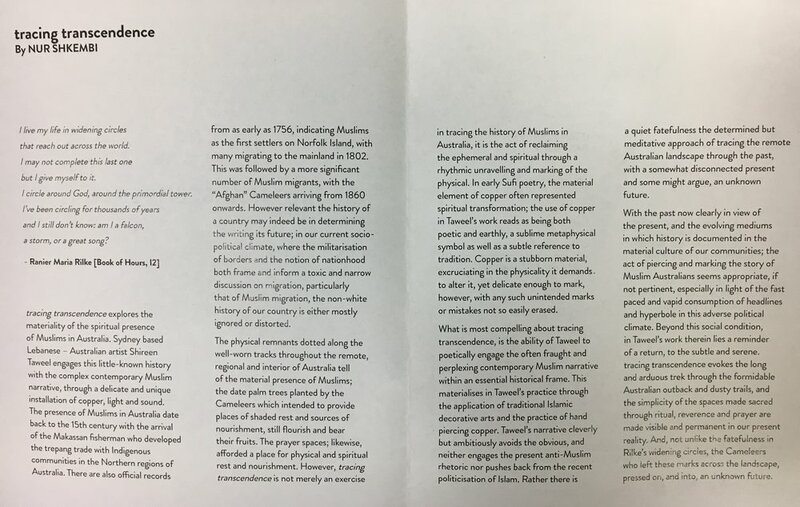 Within rural and urban spaces, from Broken Hill to Campbelltown connects distance and place throughout NSW and draws out the diversity of Islamic cultures in Australia. Specifically, the work is informed by prayer practiced at the Afghan Mosque in Broken Hill and in our urban mosques of Western Sydney. The 'Afghan Mosque' in Broken Hill, NSW is the oldest standing in Australia. Built by The Cameleers - not architects - this unique structure speaks of its local environment and materials where faith and a community's intent transferred and transformed in a new landscape. 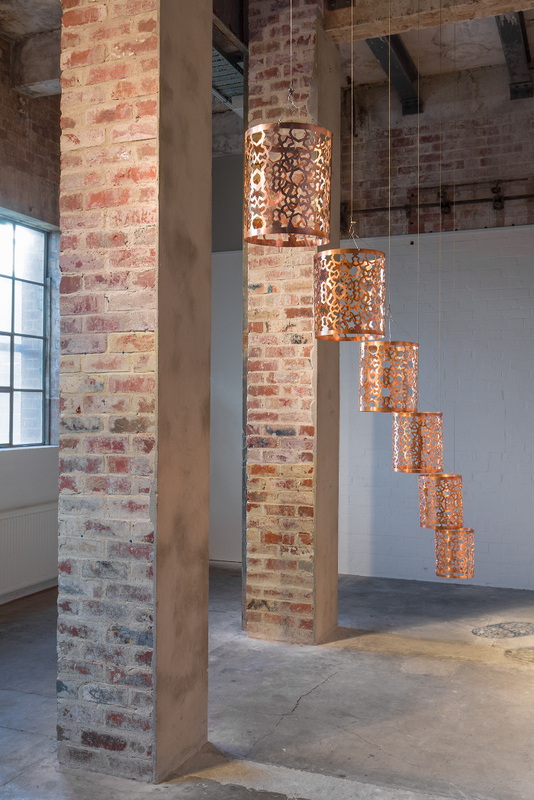 The 99 plates of hand-chased copper explore the process of chasing as a response to the pressed-tin which line the entire interior structure of The Afghan Mosque of Broken Hill. Just as much was the value of one's local sacred space during the 1800s, today's more recently settled minority communities map a rich cultural landscape of Western Sydney where non secular spaces offer a sense of faith, rootedness and belonging. The work emphasises the fluidity of time experienced between past and present, and the value of the Mosque in the Australian landscape for the future.